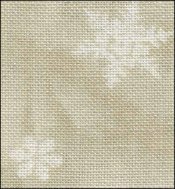 Neutral (Ecru) with White Snowflakes on Silver 28ct Linen  - $108.00 : Yarn Tree, Your wholesale source for cross stitch supplies. Item 7908. Pretty little white snowflakes scattered at random across this 28ct linen with silver fabric. Neutral color background colors similar to DMC Ecru and 822.